PHILADELPHIA (WPVI) -- It takes time to write down the name of every player who put on a Philadelphia Eagles jersey. It takes even more time to craft those names into an Eagles logo. But that is exactly what Philly artist Daniel Duffy did. 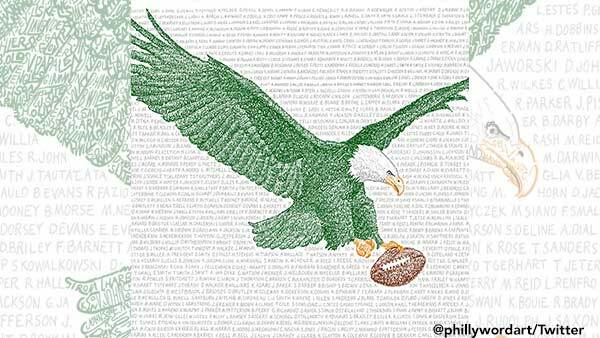 After 60 plus hours, the "Word Art" designer finally finished his "Philadelphia Eagles All Time Roster" masterpiece, complete with all 1,739 players' names. On his website, Duffy explains the logo used is inspired from various eras. "He used an image of the eagle from the 80s-90s, but has it flying from left to right - a nod to the pre-1980 graphics," the site explains. Duffy, who quit his full-time job in 2008 to focus solely on "Word Art," has created pictures out of words of a variety of subjects: a portrait of Brian Dawkins made up of his pregame speeches, the Philadelphia skyline out of street names, and an image of Harry Kalas formed by his greatest calls. Duffy told Action News Wednesday night, he's not sure what's next on his drawing board (or is it writing board?). "Would love to get some feedback or have the people vote on that one," Duffy said. All of his work is available for purchase on his website phillywordart.com.